Stan Douglas, Pembury Estate (detail), 2017. 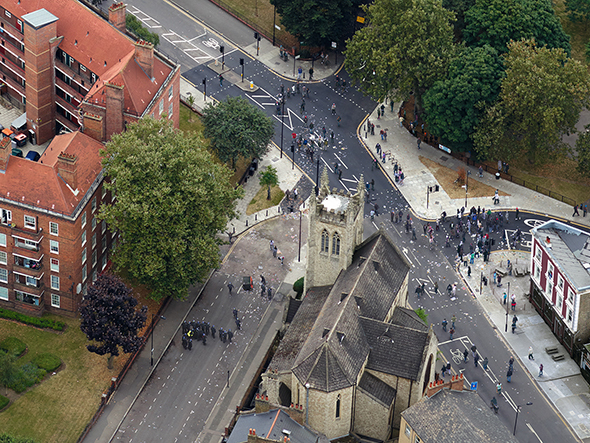 New large-scale photographic works by Stan Douglas focus on locations of the 2011 London riots. The first in a new series of works triggered by the uprisings of the early 2010s, including the Arab Spring and riots across global locations including London and the artist’s home town of Vancouver, these photographs focus on scenes associated with events in August 2011, when thousands of people rioted across London boroughs: in Tottenham, where protests started following the shooting by police of Mark Duggan, and Hackney Downs, where events were focused around the Pembury Estate. Occasions of flux, transformation and disorder, and the possibility of change they bring about, have long fascinated Douglas, who received the Hasselblad Foundation International Award in Photography in 2016. His critically acclaimed photographic series “Crowds and Riots,” 2008, explores crowd phenomena in the 20th century, focusing on subjects including the clashes between police and protestors that defined Vancouver’s Gastown neighbourhood in the early 1970s. His film The Secret Agent, 2015, restages the plot of Joseph Conrad’s novella—a story of espionage, double-crossing and political entanglement—within the aftermath of Portugal’s ‘carnation revolution,’ which overthrew Europe’s oldest dictatorship, in April 1974. Characteristic of Douglas’ sensitivity to the nuanced dynamics of public and private memory, these new works look at racial and class tensions and at confrontation and its aftermath, asking us to revisit recent history and consider the countless stories and fragments of reality in which truth and empathy lie. In an age where, because of technological advance, the veracity of the photographic image has long been cast into doubt and reality and history are easily manipulated to appear “real,” Douglas employs a billboard scale and an almost hallucinatory sharpness, the result of digital rendering, to question authorship, reality and the truth and meaning behind what we see—truth within the medium of photography and within the political and sociological issues that underpin the scenes his photographs portray. Born in Vancouver in 1960, Stan Douglas has been the subject of numerous solo and group exhibitions at prominent institutions worldwide. Recent venues have included Aargauer Kunsthaus, Switzerland (Cinema mon amour, 2017, group); Hasselblad Center, Gothenburg (Stan Douglas: Hasselblad Award 2016, solo); Pérez Art Museum Miami, Florida (Luanda-Kinshasa, 2016, solo); Salzburger Kunstverein, Salzburg, Austria (The Secret Agent, 2016, solo); Hayward Gallery, London (off-site exhibition The Infinite Mix: Sound and Image in Contemporary Video, 2016 – 2017, group); Audain Art Museum, Whistler (Intersections: Contemporary Artist Films, 2016, group); The Institute of Contemporary Art at the University of Pennsylvania, Philadelphia (The Freedom Principle: Experiments in Art and Music, 1965 to Now, 2016, group); Museu Coleçäo Berardo, Lisbon (Stan Douglas: Interregnum, 2015, solo); Fruitmarket Gallery, Edinburgh (Stan Douglas, 2014 – 2015, solo); Museum der Moderne Salzburg, Austria (Art/Histories, 2014, group); Carré d’Art - Musée d’Art Contemporain, Nîmes (Stan Douglas: Photography 2008, 2013, solo, travelling to Haus der Kunst, Munich, 2014, Nikolaj Kunsthal, Copenhagen, 2015, Irish Museum of Modern Art, Dublin, 2015 and Wiels, Centre d’Art Contemporain, Brussels, 2015); Minneapolis Institute of Arts, Minnesota (New Pictures 7: Stan Douglas: Then and Now, 2013, solo); Moscow Photobiennale 2013 (Stan Douglas: Midcentury Studio, 2013, solo); Bildmuseet, Umeå, Sweden (Theatrical Fields, 2013, group); Museum of Contemporary Art, Chicago (Think First, Shoot Later: Photography from the MCA Collection and The Way of the Shovel: Art as Archaeology, both 2013, group); The Museum of Modern Art, New York (XL: 19 New Acquisitions in Photography, 2013, group); Museum of Contemporary Art, Los Angeles, (Blues for Smoke, 2012, group, travelling to Whitney Museum of American Art, New York and Wexner Center for the Arts, Columbus, Ohio); Walker Art Center, Minneapolis (The Living Years: Art after 1989, 2012, group); ZKM/Museum für Neue Kunst, Karlsruhe (Fast Forward 2: The Power of Motion, 2010, group); and the Solomon R. Guggenheim Museum, New York (Haunted: Contemporary Photography/ Video/ Performance, 2010, group). Stan Douglas is the recipient of the 2016 Hasselblad Award. In conversation with Mark Godfrey, Senior Curator of International Art at Tate and co-curator of the exhibition Soul of a Nation: Art in the Age of Black Power, Stan Douglas talks about his latest body of work. The discussion includes a Q&A with the audience. Booking is essential via the Tate website.